Ling’s Cars - http://www. lingscars.com. 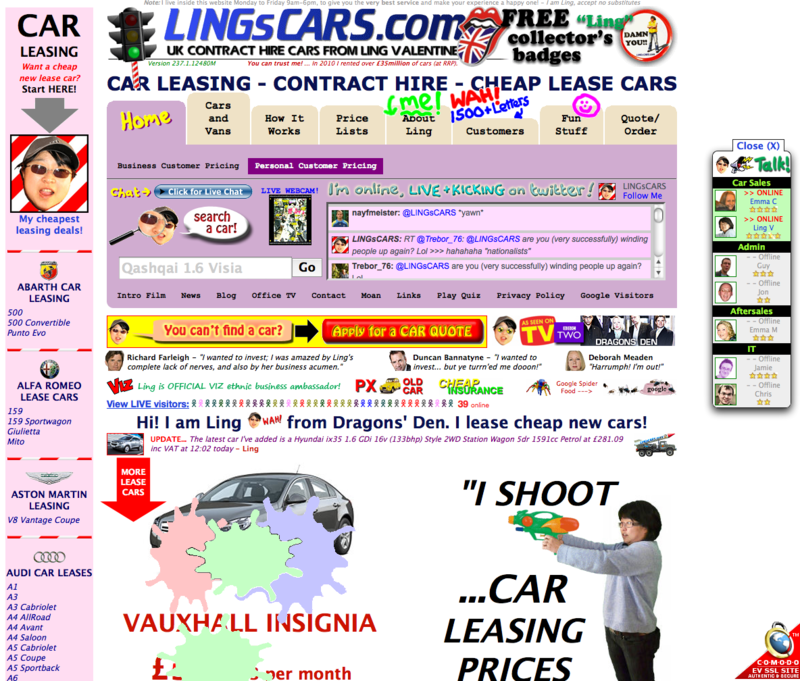 ‘Ling’s Cars’ (Owned and run by Ling Valentine; aka ‘Crazy Ling’) is a tricky site to pigeon hole into current design principles . If our principles and rationale are correct – no-one should go to this site, and no-one should like it; but they do go to the site, and they do like it – much to the consternation of the user experience illuminati. Why is this and what makes Ling’s Cars a high traffic site – discounting people like me who are just there to look at the spectacle, or design-‘car crash’, whichever phrase you prefer? There seems to be no real answer to this, the site itself breaks most of the principles of good design, usability, and accessibility. If I had to audit this site I would imagine that most users would not want to interact with it, that most users would find it too complicated, and that would most users would find it aesthetically displeasing. However, for some unknown reason it seems to attract many users, who then go on to buy the cars Ling is selling, so what’s the reason? Well this is the main question that has been on the lips of most use UX people the world over, but there still seems to be little agreement. I think that this site is all about Ling, to such an extent that the site has become a meme. This may be because it seems to be a window onto Ling’s personality, that you get the feeling that Ling is in control of everything (even if those things are bad) and that she is present – all the time – behind the scenes with her tweeting and forum updates. Further, you may think that in these times of present economic unrest, where trusted organisations have become un-trustworthy, this personal touch seems very attractive. It may be due to the current situation, the current zeitgeist of its users, its egocentricity, it may be an outlier, the one in a thousand which proves the experts wrong, and succeed when it should not. However, let’s consider this again, it’s egocentric, it has Ling’s presence, Ling is very much in control, it is her vision, and not that of a focus group, in short it has her personality. For good or for bad it has a personality, and that personality has more emotional value and emotional engagement, then any of the other five principles listed above, this made me think there is one principle which is superior to the rest. This principle is the most superior, possibly of all the principles we have formulated. If your interface can exude personality, such that it seems to be a meme – or an avatar – of who you are, a direct window into your personality, then this principle is superior to the rest. Personality might be important, but I wonder if the real reason lies in your comment about the site being an outlier. Does Ling get away with it because the novelty make the site audacious, distinctive and exciting? If other people tried the same trick and it became a more familiar style would this just seem like a rubbish website, regardless of personality? To be honest James, I’m just not sure. The more I see, the more I think that her personality and presence make the difference – but hey, I’ve got little empirical evidence for this. Whatever the cause, empirically, the principles so often trotted out are not supported, and so there MUST be other factors at work, which could be used in other developments – I still think this is personality. I think you’ve made some really good points with this — definitely with the personality aspects. I wonder if there’s also a sense of extra value for the user because it’s obvious that the site has been ‘home made’. So instead of pumping £££ into a slick design, Ling has done it herself and is therefore saving the consumer money? Hi James, I agree with you on that one. Indeed, it seems to me that it may not even have to be Ling who does the development (in fact I’m sure it isn’t) but as long as the perception is that it is ‘home made’, the principle still stands. Very nice & interesting article! I was wondering whether the value itselfe offered by the web site, going beyond the interaction layer or presonality, might also atract users. Probably good deals can overcome bad user experience.